For just $1.25, there’s no better way to view the city sights than from the mahogany seats of a slow-moving, open-air St. Charles streetcar. Head from the bustling French Quarter to the quiet, elegant Garden District to the former suburb of Carrollton and back again, on one of the oldest continually operating streetcars in the world, dating back to 1835. 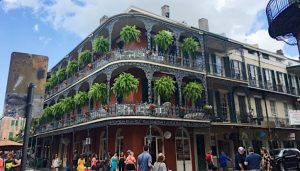 The trip takes around 45 minutes each way and offers a glimpse of some of the most exquisite homes in New Orleans, historic monuments, and the grounds of Audubon Park. 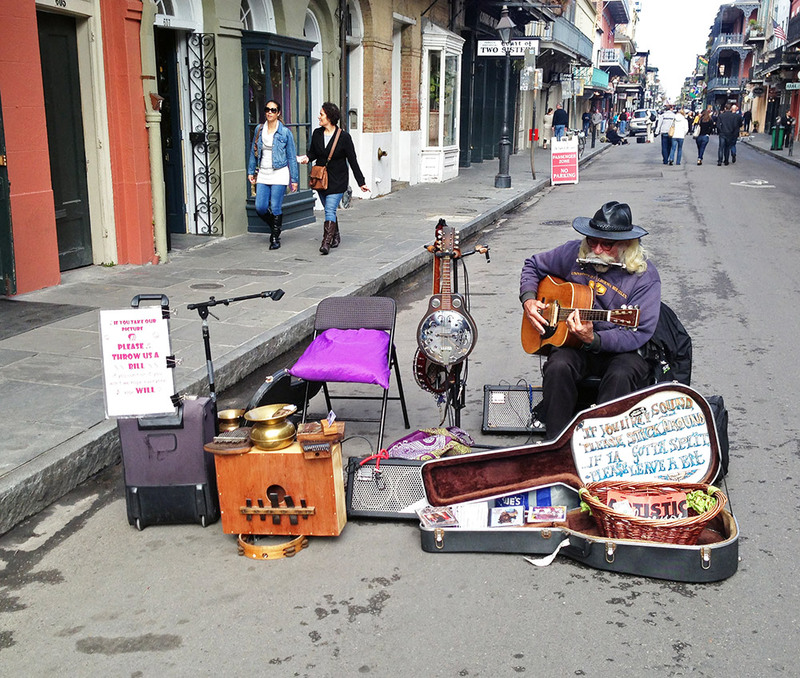 Catch street musicians around every bend in the French Quarter, particularly on Royal Street, Frenchmen Street, Jackson Square, and on the way to the Mississippi River. Be on the lookout for Tanya & Dorise, Doreen Ketchens, Buku Broux, Kenny Terry, Joe Shedlo, Tuba Skinny, and more. 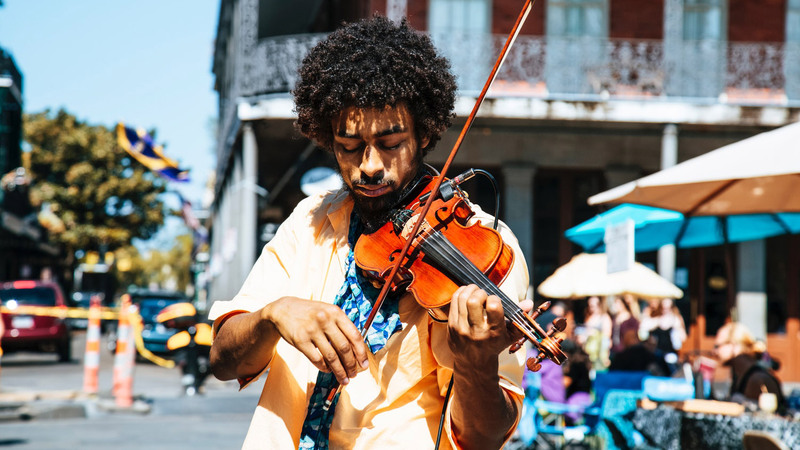 For music, hop on Frenchmen Street on a Saturday night (or any night of the week). As you stroll from club to club to hear some of the city’s best musicians and visiting acts perform an array of music (jazz, funk, hip-hop, brass-band, rock, folk, Latin, and more), you’ll be surrounded by a bustling, nonstop street performance parade that might include hula-hoopers, flame-throwers, and other buskers. Notable stops: The Spotted Cat, The Maison, and Blue Nile. See one of the most revered brass bands in one of the city’s most beloved music venues: Rebirth Brass Band at Maple Leaf Bar. A $15 cover charge comes with an opportunity to hear brass-band standards like “Do Whatcha Wanna” and “Feel Like Funkin’ It Up” from this Grammy-winning group now considered a New Orleans institution. The show starts at around 11pm on Tuesday nights. If you seek a more mellow vibe, head over to The Carousel Bar & Lounge at the Hotel Monteleone where you can sit in a slowly revolving carousel listening to live music. While there, order the Sazerac, a cocktail created in New Orleans and arguably the first-ever mixed drink. For a unique window into the culture and history of New Orleans, attend Mass at St. Augustine Catholic Church, one of the oldest African-American Catholic churches in the US, located in Tremé, the country’s oldest predominantly African-American neighborhood. Dedicated in 1842, this welcoming church hosts a weekly 10am Sunday mass filled with heartfelt gospel-jazz music. Afterwards, you can feast on Creole gumbo, seafood platters, and po-boys at Li’l Dizzy’s Café. In one of America’s best food cities, standouts include Shaya, named Best New Restaurant in the US at the James Beard Awards in 2016; refined Southern cuisine at La Petite Grocery, and Balise, whose owner won Best Chef: South at the James Beard Awards in 2016; and Cochon, whose award-winning focus is Louisiana foods with a pork-filled point of view and local microbrews. The newly re-opened Gabrielle, which like many beloved establishments was forced to close after Hurricane Katrina, is known for their roasted duck, barbecue shrimp pie, and baked oysters, as well as a dessert they call the peppermint patty. For Southern fried chicken fans, you can dine on fried chicken in the Seventh Ward, twice. Family-owned and operated with 90-plus-year-old matriarchs at the helm, and housed within two blocks of each other, Willie Mae’s Scotch House and Dooky Chase’s Restaurant offer world-renowned food. With differences in ambiance and chicken-frying styles, Willie Mae’s is more casual with a wet-battered crispy chicken cooked to order, while Dooky Chase is a white-tablecloth establishment with a lunch buffet. Friday Lunch is not simply synonymous with lunch on Friday – it’s an actual event. Several local restaurants which are only open for dinner are also open for Friday Lunch. The standard-bearer is Galatoire’s, founded in 1905 and considered one of the top 10 greatest old dining institutions in the world by The New York Times. The gumbo is a standout in their primarily Creole menu. A line forms about an hour before it opens at 11:30am–and it’s not uncommon for Friday Lunch to extend into dinner. The original open-air (and very popular) French market coffee stand, in business since 1862, Café du Monde might be the most obvious tourist attraction in the French Quarter, if not the entire city. It’s definitely worth the trip to get a heaping plate of beignets and chicory café au lait. For shopping, there’s something for everyone: The French Market offers a bounty of gifts along with a farmer’s market and live music; Magazine Street is a 6-mile stretch of shops, art galleries, and restaurants known as “the street of dreams.” You can also experience New Orleans’ voodoo culture at Voodoo Authentica or Island of Salvation Botanica, founded by a self-described “Jewish girl from Maine” turned Voodoo priestess, who has been in practice since 1977. Some interesting museums that are off the beaten path: New Orleans Historic Voodoo Museum, Museum of Death, New Orleans Pharmacy Museum, and The Historic New Orleans Collection. If you’re looking for incredible art in the French Quarter, stop by M.S. Rau Antiques and politely ask for a museum-like tour of the “secret room.” You’ll be led through a disguised door to a 3-story collection of mind-blowing historical art and artifacts, from Van Gogh to Monet to Norman Rockwell to Napoleon Bonaparte’s death mask to a dinosaur skeleton, all of which are also available for sale. Lastly, New Orleans’ historic cemeteries are comprised of predominantly above-ground crypts with colorful tomb inscriptions, some dating back to the late 1700s. St. Louis Cemetery No. 1 famously houses the tomb of Voodoo Queen Marie Laveau. Recently, Nicolas Cage built a huge pyramid there where he apparently plans to be interred. Rumor around town has it that he’s felt cursed ever since he bought LaLaurie’s infamously haunted mansion, and thinks that being next to Marie Laveau might release the curse. To book a cemetery tour, contact Save Our Cemeteries. For a taste of New Orleans in NYC, check out the boundary-breaking and illustrious Preservation Hall Jazz Band at Brooklyn Bowl on October 29. 10 Must-Try Brooklyn Summer Camps!